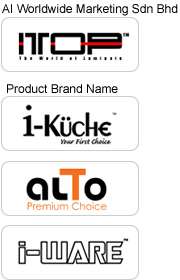 AI Hardware Sdn Bhd established since 2009, our company specializing in import, export, OEM and local distribution of furniture hardware , kitchen accessories, General Hardware, Aluminum Extrusion etc. AI Hardware Sdn Bhd operates based on 3 basic principles, Quality products, Competitive price and Excellent customer service. AI Worldwide Marketing Sdn Bhd, subsidiary of AI Hardware Sdn Bhd, is one of the major importers of HPL products and PVC Edging in Malaysia. AI Worldwide Marketing Sdn Bhd supply wide range of HPL product such as solid colors, woodgrain colors, pattern design and offered under our own brand . AI Worldwide Marketing Sdn Bhd conducts intensive quality check on each of the product to ensure all products always in good condition. AI Worldwide Marketing Sdn Bhd continuous study and increase our HPL product range in order to meet customer needs from time to time. -Drawer Slide, Conceal Hinge, Pipe And Bracket, Shelf Support, Decoration Hardware, Stay, Catch, Hi-fi Hinge, Roller And Accessories, Furniture Legs, Furniture Lock, Door Hinge, Door Accessories, Grip System, Turn Swivel, Castor, Interior Fitting, Bracket, AA System, Woodworking Machine, General Hardware, Router Bit etc. - Pull Out Basket, Three Layer Basket, Front Pull Out Basket, Magic Corner, Dish Rack, 180^ Swivel Basket, Tall Unit, Bottle Rack, Duster Bit, Wardrobe Accessories, Clothes Rack etc. - Mini Pole And Bracket, Nylon Wall Plug, Track For Roller etc.